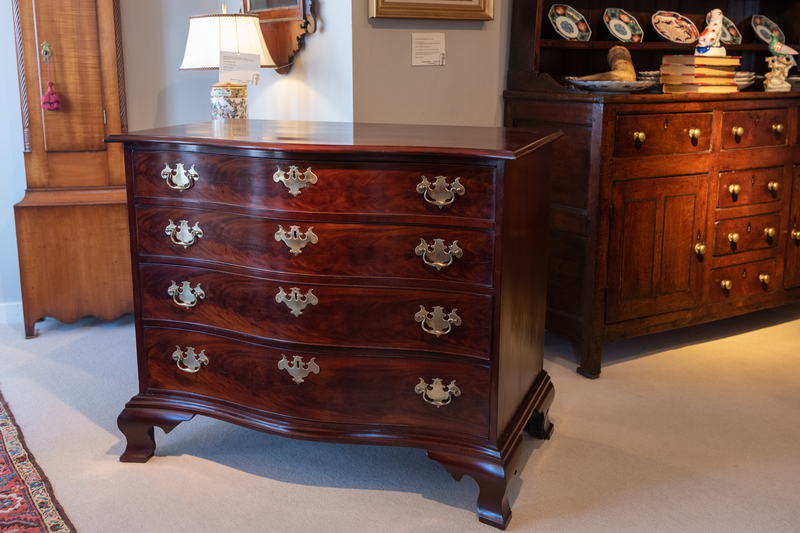 Chippendale Cherry Bowfont Chest Of Drawers, The Two Board Top With Molded Edge Above Four Graduated Drawers, Retaining Antique Brass, But Not The Original. Ending In A Molded Base And Raised On Bold Ogee Bracket Feet With Pads. *Retains A Warm Patina And Excellent Proportions. 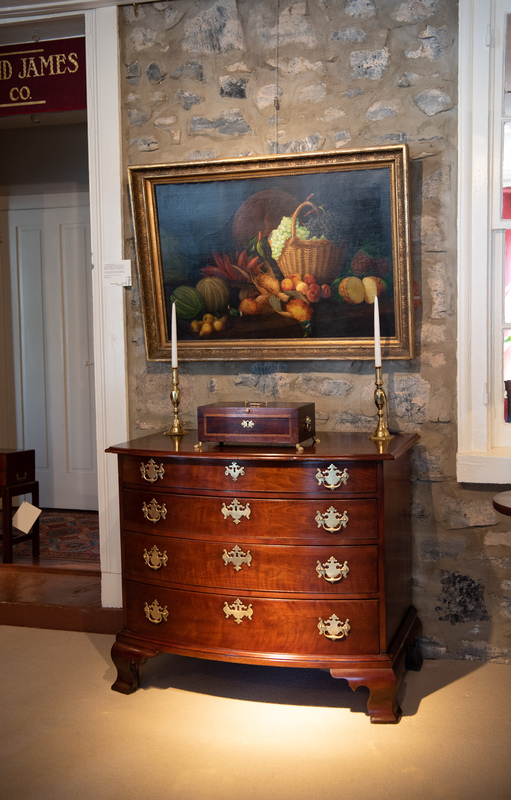 Connecticut, Circa 1770-1780, H. 33" W. 39 1/2" D. 24"
Federal Walnut Step-Back Cupboard In The Two; The Upper With Stepped Cornice Having Inlaid dentil-Molding, Above Two Glazed Doors With Rat-Tail Hinges And Two Small Drawers, The Projecting Lower Case With A Work Surface And Reeded Edge Above Three Drawers, Over Two Double Paneled Doors, All Raised On Tall Turned Feet Ending In A Flattened Ball. 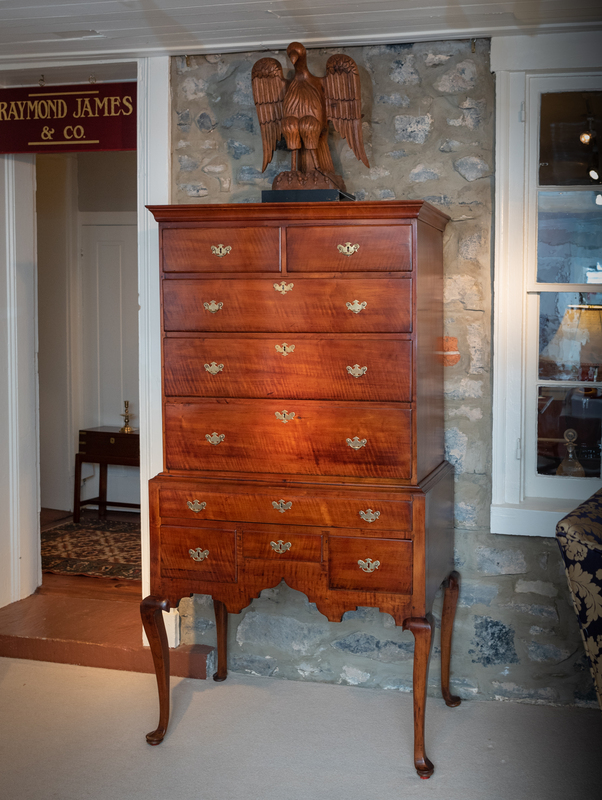 Delaware Valley, Pennsylvania, Circa 1800-1820, W. 66 1/2" H. 87 3/4" D. 20 3/4"
Federal Cherry Inlaid Chest Of Drawers, The Rectangular Top Having An Inlaid Star And Diamond Shaped Inlaid Corners, Above Four Graduated Line-Inlaid And Diamond Shaped Inlay On The Drawers, Flanked By Fluted Corner Columns Ending In A Molded Base, Raised On Tall Bracket Feet. Minor Various Patches And A Back Support, On Rear Foot Replaced. 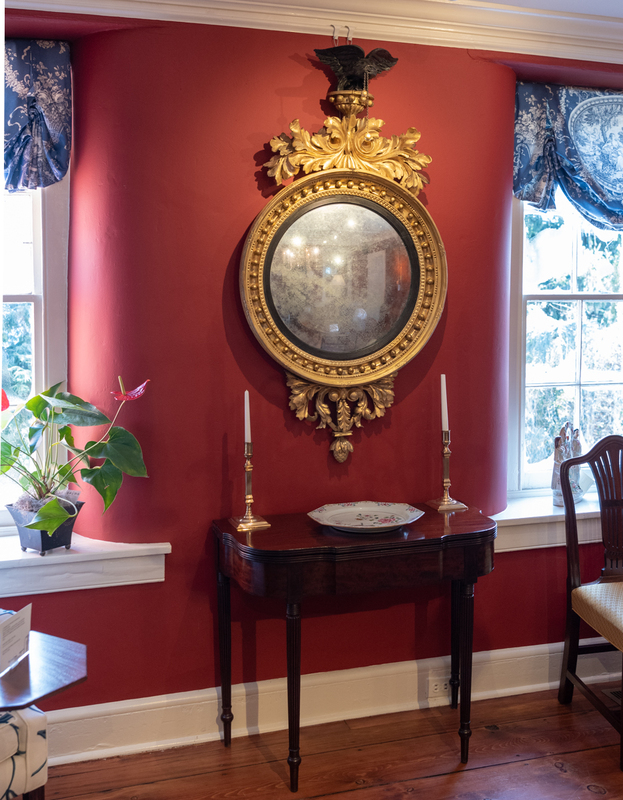 Retains The Original Brasses*, Southern, Probably Virginia Or N. Carolina. 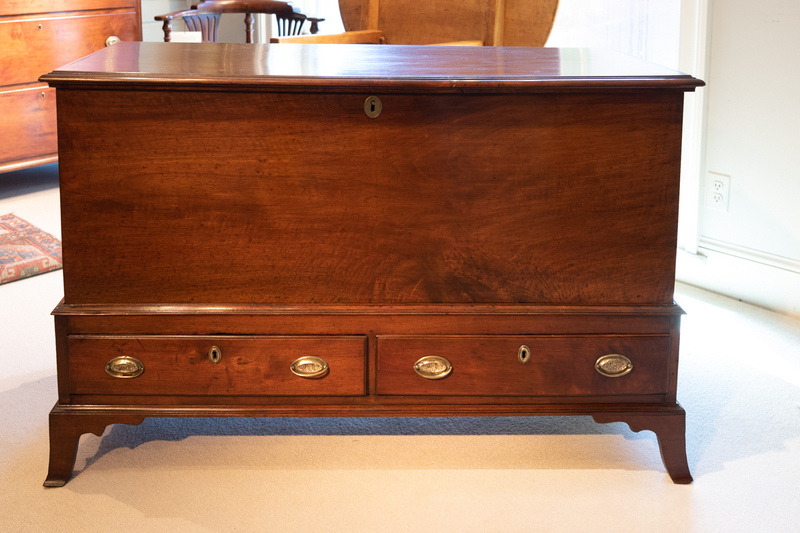 Circa 1795-1815, H. 38 3/4" W. 42 1/2" D. 18"
Chippendale Walnut Blanket Chest On Stand. 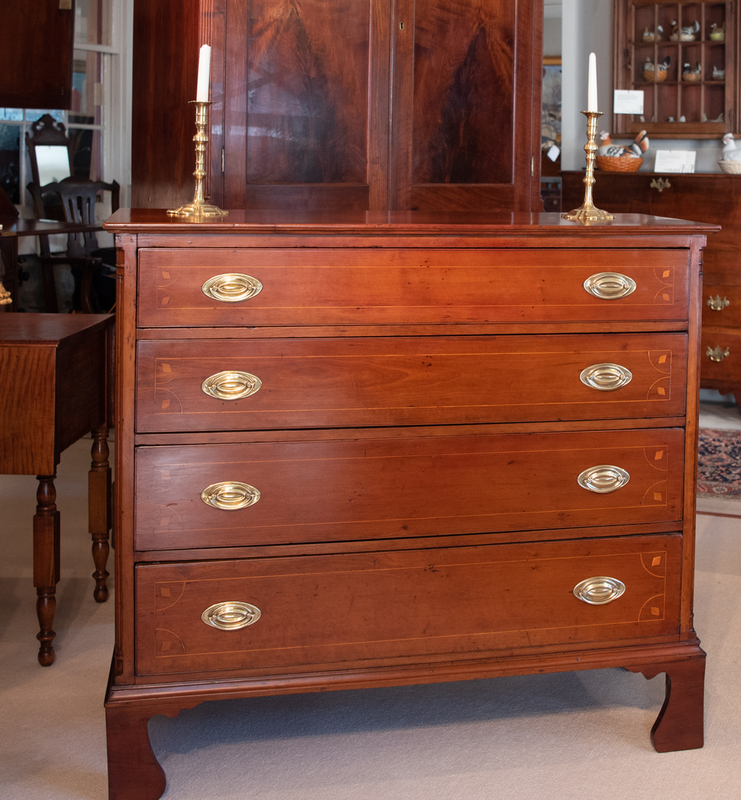 Chippendale Walnut Blanket Chest On Stand. In Two Parts; The Rectangular Molded Top Opening To A Storage Area With Till And Shelves. 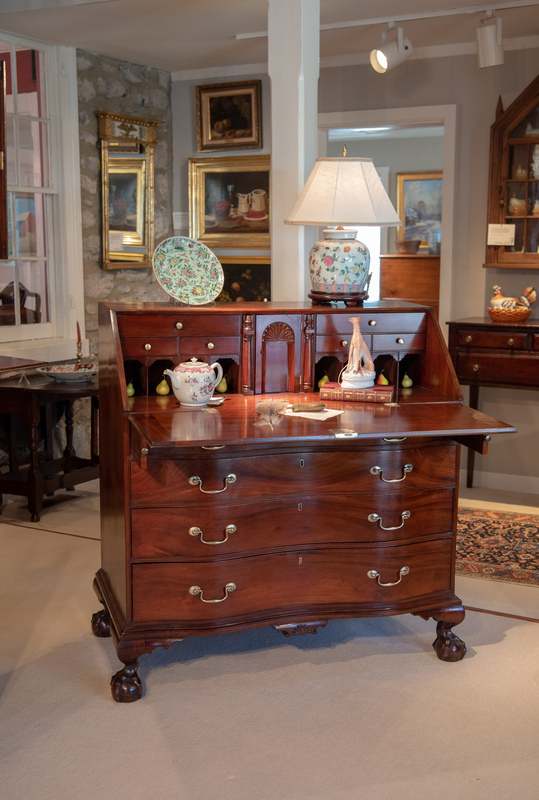 The Lower Section With Mid-Molding Drawers, Retaining The Original Oval Brasses. 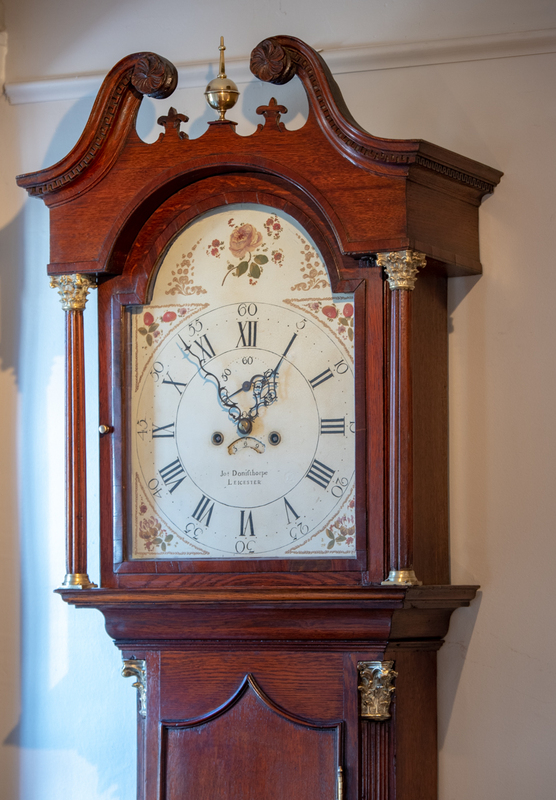 Ending In A Molded Base And Raised On Slightly Flared Bracket Feet. Pennsylvania, Circa 1795-1800, W .50" H. 32 1/4" D. 21 1/8"